The vast majority of Dominicans are of African descent. There is a growing mixed population along with a small European origin minority (descendants of French and British colonists along with some people of Irish descent) and there are small numbers of Lebanese, Syrians and Asians. 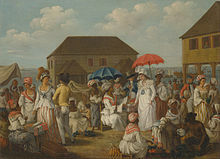 Dominica is also the only Eastern Caribbean island that still has a population of pre-Columbian native Kalinago (previously called Caribs), who were exterminated or driven from neighbouring islands. As of 2014[update] there are more than 3,000 Kalinago remaining. They live in eight villages on the east coast of Dominica. This special Carib Territory (now Kalinago Territory) was granted by the British Crown in 1903. There also used to be an annual 1,000 medical students from the United States and Canada who studied at the Ross University School of Medicine in Portsmouth, but whose campus permanently relocated to Barbados at the beginning of the 2019 Spring semester due to extensive hurricane damage suffered at the Dominican campus. The population growth rate of Dominica is very low, due primarily to emigration to other countries. In the early 21st century, emigrant numbers for the most popular countries are as follows: the United States (8,560), the United Kingdom (6,739), Canada (605), and France (394). 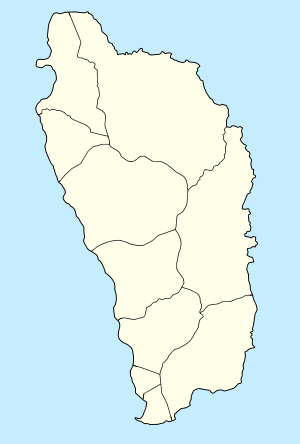 Dominica was partially integrated into the federal colony of the Leeward Islands in 1832. Later, in 1871, it became a full part of the Federation of the Leeward Islands. From the start it was a peculiar relationship for previously Dominica had played no part in the political or cultural traditions of the other more Anglophone islands of the federation. Now, as a Leeward Island, this much larger territory, with thousands of acres of forested unclaimed land, was open to the people of Montserrat and Antigua. At the beginning of the 20th century, the Rose's Company, which produced Rose's lime juice, saw demand for its product outgrow its ability to supply the product from Montserrat. Their response to the situation was to buy land on Dominica and encourage Montserrat farm labourers to relocate. As a result, there came to be two linguistic communities in Dominica, Wesley and Marigot. 61.4% of the population is Roman Catholic, though in recent years a number of Protestant churches have been established. About 10–12% of the population belongs to one of the Seventh-Day (Saturday) denominations, which includes Yahweh Congregation, Church of God (Seventh-Day), and the Seventh-day Adventist Church. According to the Association of Religion Data Archives, in 2010 the World Christian Database reported that the largest non-Christian religious groups included: spiritualism followed by 2.6% of the population; Bahai followed by 1.7%; Agnosticism followed by 0.5%; Buddhism, Hinduism, and Islam, each followed by 0.1%; and Chinese folk religion, Neoreligions, and Atheism each followed by non-negligible proportions (i.e., <0.1%) of the population. The nation's first mosque was built near Ross University. ^ "Medical school relocates to Barbados after hurricane". washingtonpost.com. Retrieved 3 August 2018. ^ "Adtalem Global Education Announces Barbados as New Location for Ross University School of Medicine". Adtalem Global Education. Retrieved 3 August 2018. This page is based on the Wikipedia article Dominica; it is used under the Creative Commons Attribution-ShareAlike 3.0 Unported License (CC-BY-SA). You may redistribute it, verbatim or modified, providing that you comply with the terms of the CC-BY-SA.